eMagic Supply Blog: Vectra™ Sets the Standard for Invisible Threads... Again! Vectra™ Sets the Standard for Invisible Threads... Again! 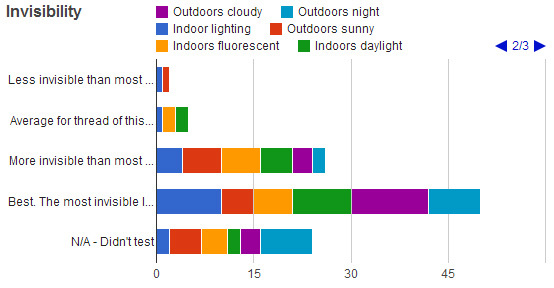 The results of our testing are in and Vectra Virtuoso performed even better than we had hoped. Thank you to everyone who ordered a sample and especially those of you who took part in the beta-testing and contributed to these results. We've picked out the highlights to share here and will run though them briefly. 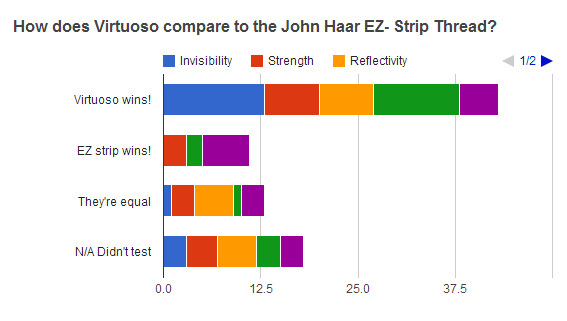 So it turns out that Vectra Virtuoso is more invisible than other threads but without sacrificing a bit of strength! It's just as strong as the John Haar EZ strip, or wooly nylon thread. And what's more, we knew Virtuoso had one more trick up it's sleeve. Exceptional performance. We didn't know if our users would notice, but they did. 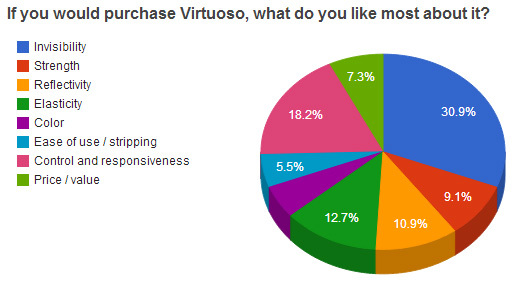 When asked what they liked most about Virtuoso, invisibility topped the chart. But as you can see below, the next favorite was Control and Responsiveness, taking a big chunk of the pie proportionately. Also notice the next runner-up, Elasticity. A feature unique to Virtuoso, it has a perfect elasticity that actually absorbs shock, resulting in a smoother performance and increased feeling of control. We're glad you noticed! Again, we really want to thank our beta-testers for doing such a great job. It feels great to bring a product to market that's been thoroughly tested and given your stamp of approval. 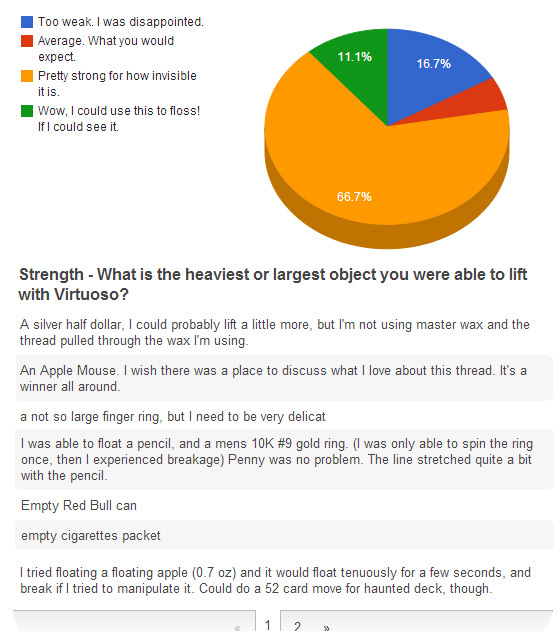 Lastly, here are a few comments from testers to give you some idea where Virtuoso lies in the spectrum of threads. It's our most fragile Vectra™, we expect it to be the choice of experienced thread workers, not necessarily the best choice for a beginner. In that case we recommend the Original Vectra Line.